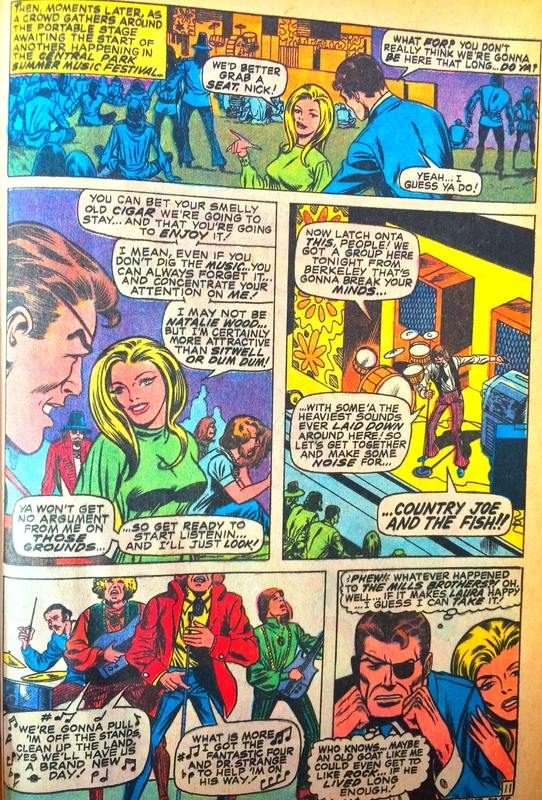 I love music, I love old comics – well dang me, if in the November 1969 issue of Nick Fury Agent of S.H.I.E.L.D these parallel interests of mine didn’t converge. 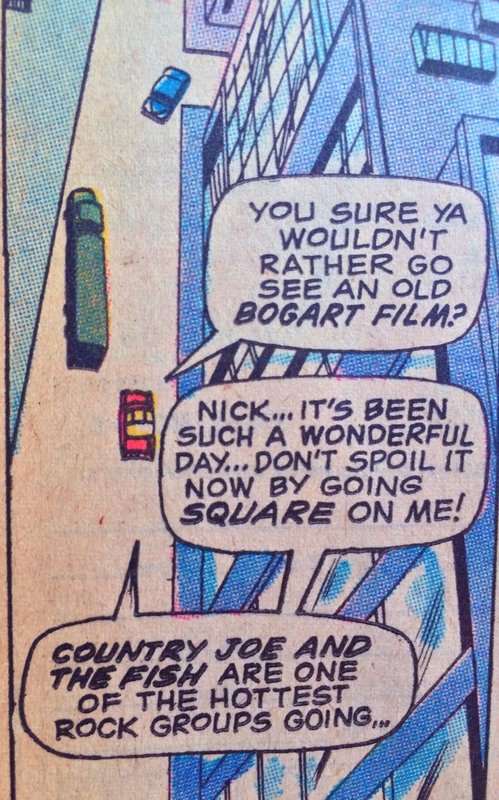 Now I already showed you a previous issue featuring a mind-controlled band as baddies, but this is different because Nick is taken, by his younger date, to see a real band, none other than Country Joe & The Fish. I find it fascinating as Nick’s attitude mirrors those of the Marvel artists and writers who created him – he’s older, pro-establishment, distrustful of all this unfettered youth and free love – but he clearly sees the need to play along in order to snare a piece of tail*. 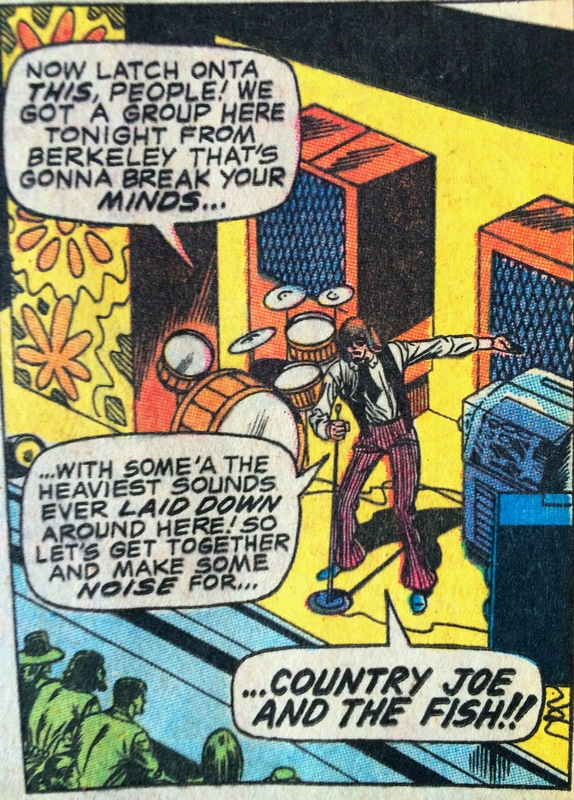 So what happens when he’s having his mind-broken by Country Joe & The Fish playing ‘Superbird’**? 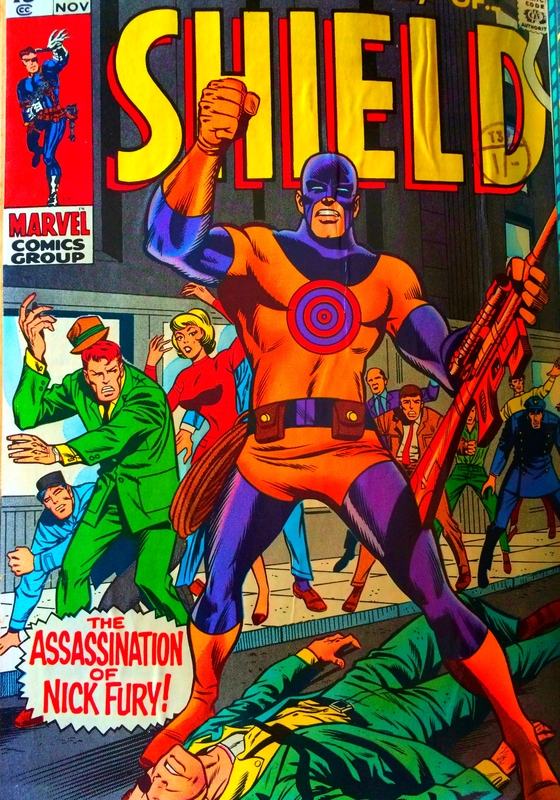 well the sniper super villain Bullseye shoots him in the head … far out. This comic is so much of its time, it virtually reeks of patchouli. 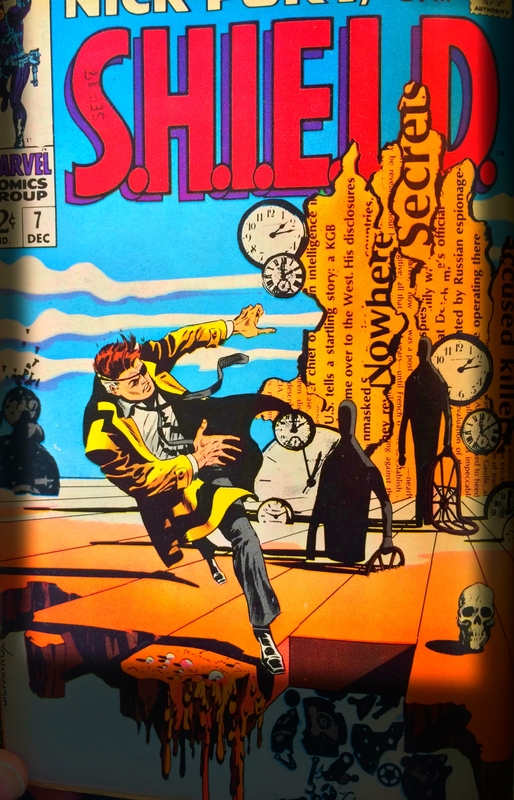 But let’s leave that cliff-hanger right there and get to one of my fave comic bits from the 60’s, the ads. 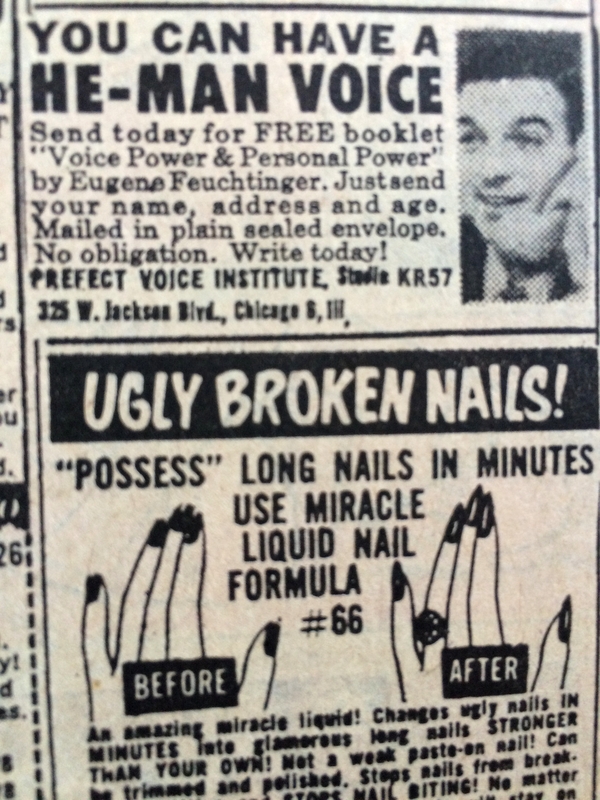 I’m definitely going to be sending away for the he-man voice training, time to send a cheque to Eugene Feuchtinger^; my nails are perfect so I don’t need to worry about that. And as a bit of a bonus check out these two 1969 beauties, in the last one Nick appears to be battling Salvadore Dali. 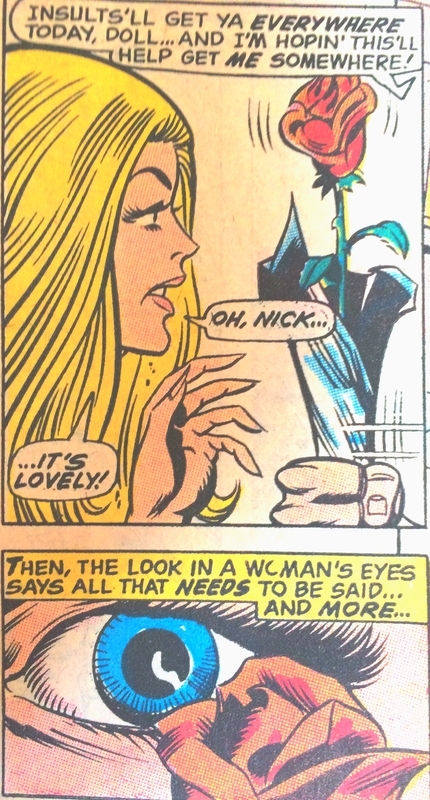 *Hell, we’ve all been there Nick. **they didn’t get to the about making LBJ drop acid, unfortunately. 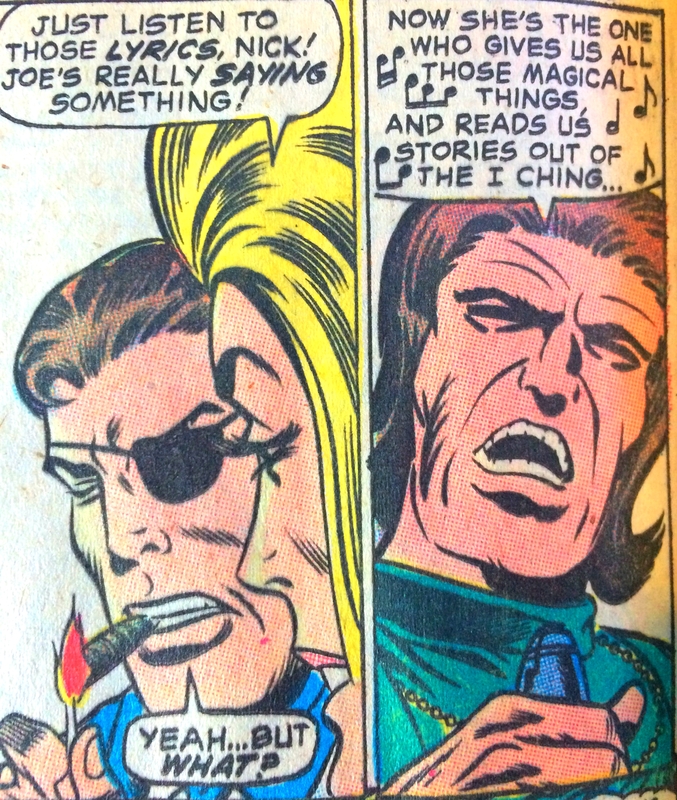 I love how Nick Fury is almost like Alan Moore’s “The Comedian” from Watchmen in this. Fury seems so gruff and grizzled, like a proper WWII or Korean War vet. And of all bands to see, they see Country Joe and the Fish. Classic. That’s very true actually I hadn’t picked up on that. I know what you mean, I wonder if he went to see The Mothers of Invention in the next issue? Now that would’ve been interesting. I had no idea this existed! So awesome. And fntastic reportage, and I really appreciate all the images and the fun of reading some of the panels, and do you really see giant eyeballs on first dates? 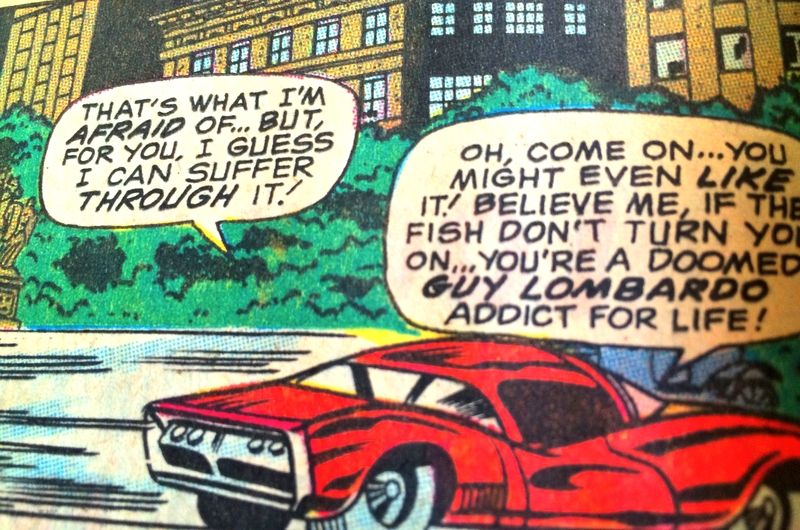 Thank you, I love this treasure trove of comics I was given. My last first date was way over 23 years ago, so I really can’t remember – possibly. It’s a good idea not to get assassinated on a first date though, I remember reading that in an advice column once. My uncle just gave me binders and binders full of them a couple of years ago. All worth very little because he took them apart and preserved them in a binder but that’s not the point … well, when I occasionally see them go for $2-300 US on eBay I grit my teeth. 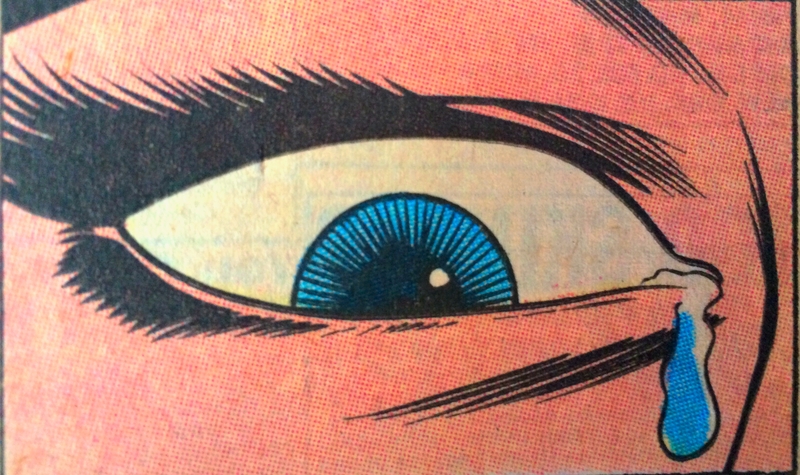 Nick Fury, Doc Strange, the Demon, Deathlok, Conan, Krull, all the old Jack Kirby ones … I’m a lucky man. and I totally second your Harvey Kurtzman comments. Aw man! Nick! Looks like one of them season finale kind of cliff-hangers, too. I know! sadly I’m missing the next issue believe it or not! Aw whit!? This is like the cancellation of Carnivale all over again! Lend me $200 and I’ll gladly post the follow-up issue!! Used notes only, leave behind the cistern in the third cubicle on the left. That breaking minds stuff can be tricky. Hope Mr Fury pulls through. It’s what happens when you expose a square to too much free love and a funny protest song. Sadly I’m missing the next issue, so I may never know (unbound copies fetch approx. $200 US – my uncle very kindly gave me a bunch of ones he’d bound himself). Great stuff, mind broken. 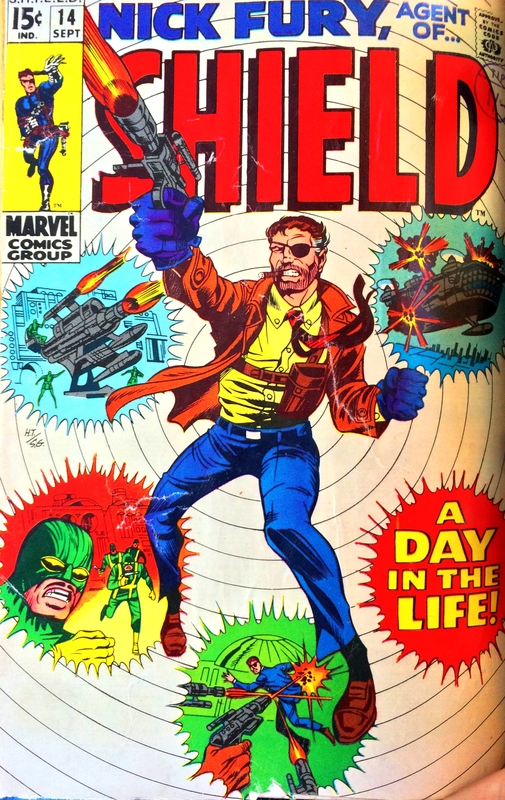 Apropos of nada, Nick Fury is a great name, isn’t it. In one past job iteration I worked with various Brit military folk. I remember three of their names (or at least the names they gave me; I’ve always been more than a little suspicious and now even moreso). Evan Fury, Nick Champion, and (something) Molehurst-Cocksworth. I solemnly swear to track them down for you, or my name isn’t Chuck Dangersteed! Don’t know what’s funnier, the comic book or the ads. Always the ads I think – it’s America’s 1960s insecurities laid bare. Be stronger, have a he-man voice etc. Good point. What makes it funny is they didn’t care how transparently insecure those ads made people look.